Bee Beard sports a great entrance hole, but the bees use the slot between the hat and the top of head most of the time. I don’t understand it…I give them a beautiful 1.5 inch (3.81 cm) diameter entrance hole in my log hive, yet they insist on using the small slot between the hat and the top of head. The entrance the bees are using is less than .25″ (about 6 mm) even though a beautiful round entrance hole was provided for them below. A short video can be seen here showing the bees entering through narrow slot between hat and top of head, followed by a shot looking through the observation window to see the natural comb. This was shot 17 days after the transfer from bait box to log hive. Bee Beard Gets a Life (20,000). I wanted to try the same thing, but not being retired I knew I wouldn’t be able to spend so much time hollowing it out. I looked up log hives on the web and came across Gaia Bees. I emailed Michael Thiele who gave me directions on hollowing out the log. It was about this time that a new beekeeping friend, Terry Kelly of Berkeley, a writer, top bar beekeeper, and mushroom log grower, started sending me packets of bee articles he liked. My log was partially hollowed out when another packet of articles came in the mail. The very first thing I saw were copies of Slovenian Bee Hive Art. Not only were there paintings but there was a face carved on the front of a hive that served as the entrance to the hive. The bees entered through the mouth, nose, and eyes into the hive. It took all of 10 seconds to decide I wanted to do something like that on my log hive. 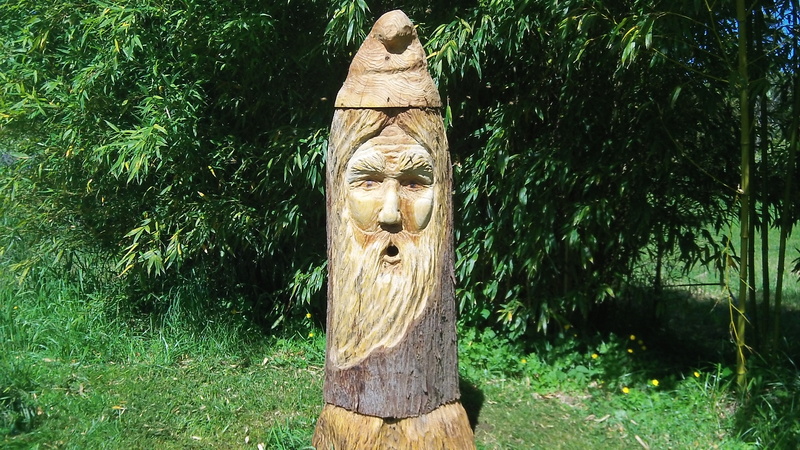 I shared my idea of a wood carving with my wife, and she suggested I try the new chainsaw wood carver in town. I talked up the idea with Brian and Zada Vorwaller. He offered some suggestions and we came up with Bee Beard. His wife, Zada videotaped the carving and my son-in-law, Jim Montgomery edited, sped it up, and made it you-tube acceptable. 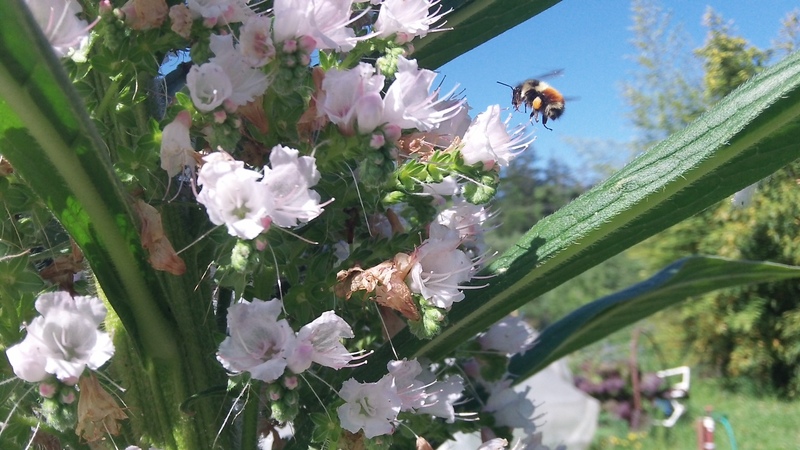 I wanted feral bees if possible, but commercial hives are placed in the bogs near me between late May into mid July. I knew I had to populate the hives before the bog bees got interested. How to get feral bees became an obsession. After reading McCartney Taylor’s book on Swarm Traps and Bait Hives, I built 9 bait hives. Hung them mostly on private property. 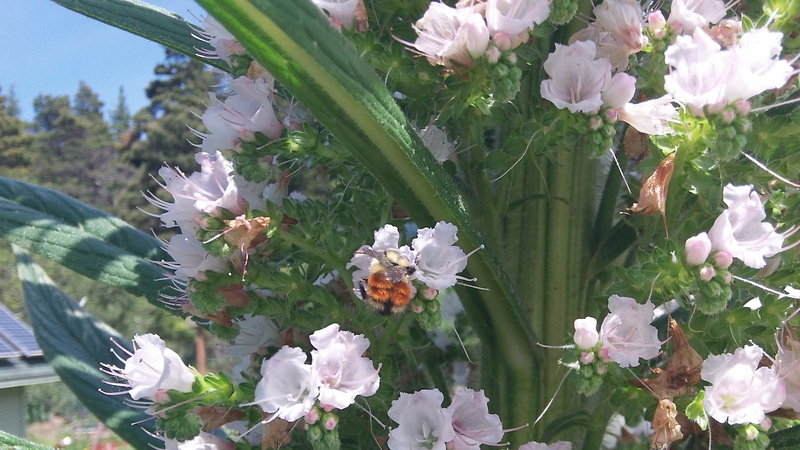 I want to thank Bernhard Zaunreiter (see Swarm Trapping 2012) for posting a photographic “how-to prepare bait hives” post on the biobee.com forum,” and answering my bait hive questions. I finally was rewarded after placing two boxes on or near feral bee hive trees. On one of the weekly inspections, both had caught swarms. 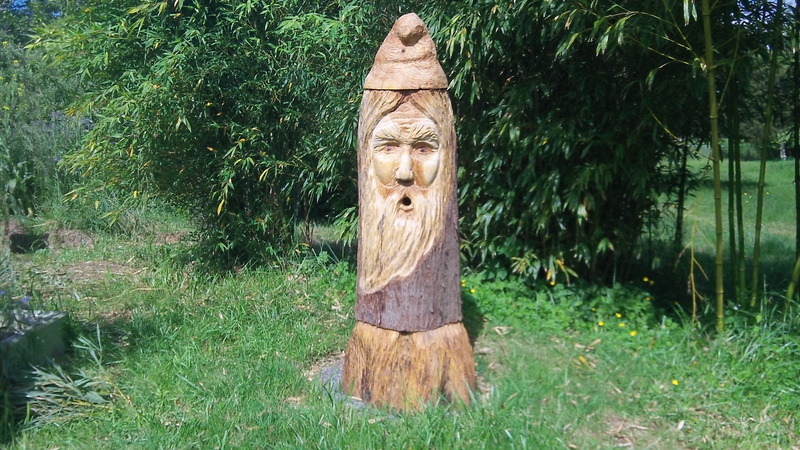 This bottom tree supplied Bee Beard. The transfer of bees from bait hive to Bee Beard was quite an adventure, but the bees are settling in now and the itching is subsiding. I want to express my appreciation to Phil Chandler for creating biobees.com forum. I’ve got so much to learn and this is a very friendly, positive and informative place to do that. Thanks to those stalwart friends who gave me encouragement during my dark days of no bees, when I started regretting not ordering package bees and despairing that I wouldn’t get ANY bees for another year. Mobeek, Bugscouter, KittyLabyrinth, newwoman, baz, and jaywoo kept me going. This short video shows the bees entering through the hat. I left a little gap in the quilt box to make it easier to pull out. I think that’s where they are going. A few enter through the mouth entrance. I’m hoping when the comb gets built down that far, they will use the mouth entrance more. I noticed the bamboo is shading the hive too much in the afternoon…the Warre Hive, on the south side of the bamboo works 1-2 hours longer, so I’m going to trim back the bamboo to get more sun in late afternoon. After all, that could spell the difference between making it, or not making it. 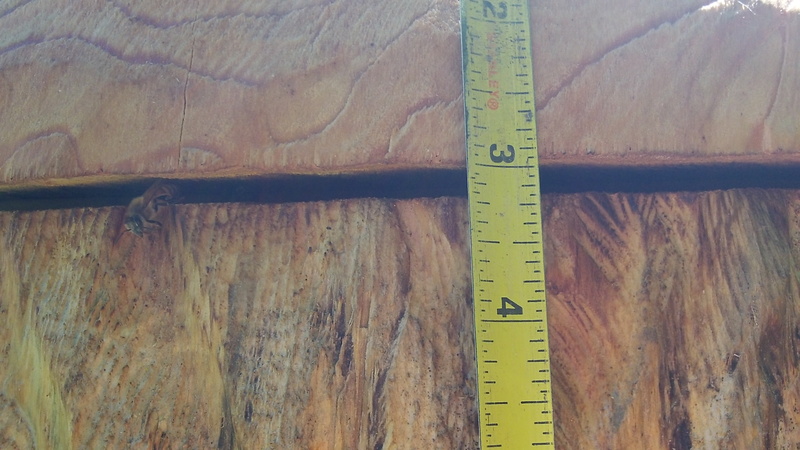 Grand Kids Log Hive gets bees…two swarms almost at same time. Saturday brought the usual “check the bait boxes routine”, sigh over no bees yet, and daub some lemon grass oil on the outside. The first box I looked at was on the feral tree on private land. “WOW, I’ve got bees and they’re bringing in pollen. That means they’ve got a laying queen.” What do I do now? I’ll check the other bait hive across from the park…”WOW, that’s got bees too, and they’re are also bringing in pollen. Yikes, I can’t handle two at once.” I talked with Hal who advised me to wait until all the foragers came in. That would be another two hours. Went home to get my wife so she could provide moral support. At 8:15 pm we stuffed some paper into the entrance hole and duct taped it securely. Got back around 8:45 pm. Should we stick them in now or wait til morning? We might get rain in the morning and it’ll only take a few minutes, let’s just put them in now. Plan is to unscrew the lid of the bait box, lift out the bars, put them in the top of Bee Beard log hive, put the quilt box in and pivot the hat back in place. Since I had just had a successful swarm retrieval two days prior, I had confidence this would take about 15 minutes then we sit down for a cup of tea and congratulate ourselves. The transfer did not go as planned…I didn’t suit up properly, it was almost dark, and as soon as I started to remove the lid I knew I was in trouble. Wife says…”sounds like they’re mad.” I tried gently lifting the bars out, but had to jerk them a bit. The bees went ballistic. Then the stings started. They got up into my bee suit between the veil and my face, up my pant legs, and on my wrists. At least I found out I’m not allergic to multiple bee stings, although I’m itching a bit. I had to vacate the area with the box lid part way open, the top of the log hive open, and our confidence shot. 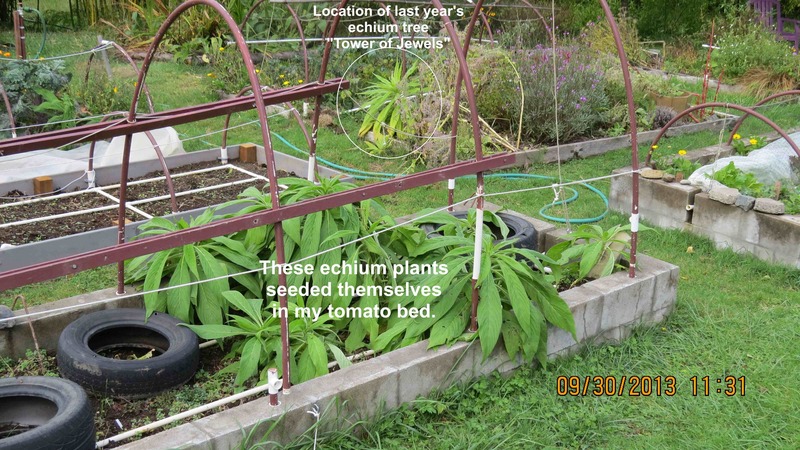 All night I’m trying to formulate a plan of action for the next day…wondering what the heck I was doing…how did I ever think I would be able to pull this off, are these bees going to attack my wife and I when we’re working in the garden? What about our pets? Why did I want feral bees? What was I thinking? 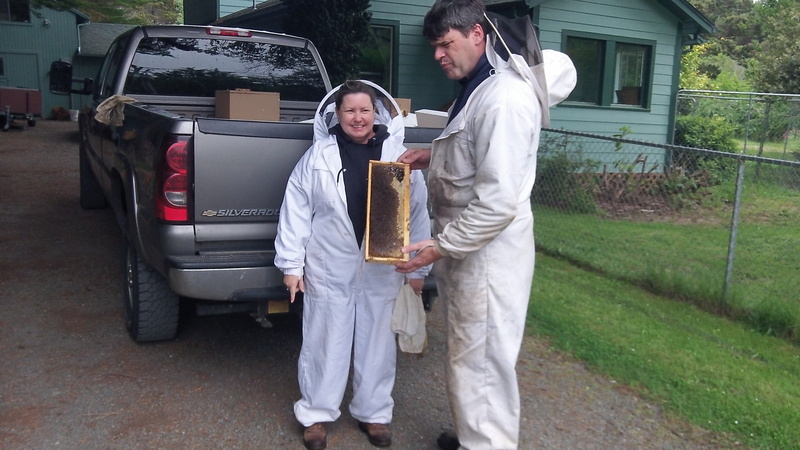 Next day I called Shigeo from the Coos County Beekeepers Association. We talked about the incident and about the other bait hive which I was NOT about to get. He says to call Randy. Well, I know Randy, he’s awfully busy with his regular job, plus the last count of swarms he had gotten, was 23 and that was a week ago. He probably doesn’t need any more. I’ll call Del, another club member. 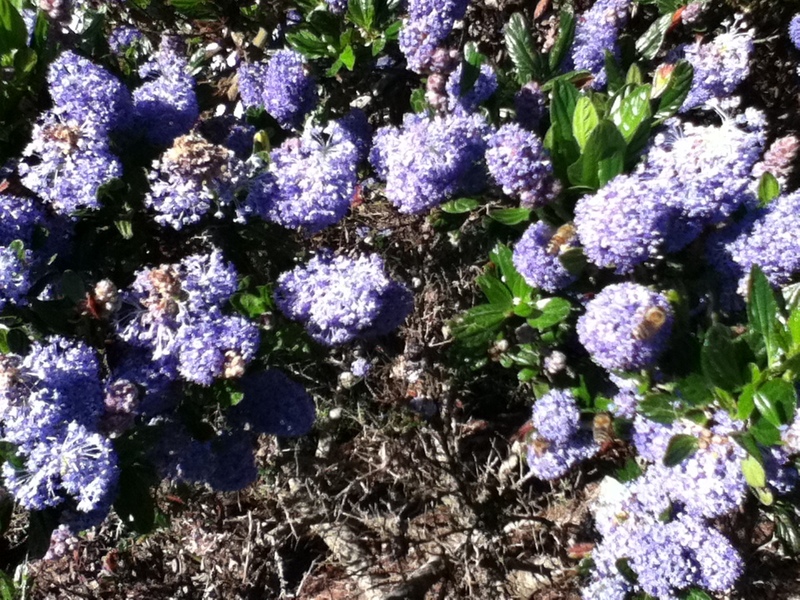 We talk for awhile, he builds up my confidence and says “call Randy.” I call Randy who luckily happens to be working with the bees in the blueberry farm on the coast. (my area). Randy says he’ll be over as he finished up early on the blueberries. I better get ready. Find the smoker. (never been used), light it up so it looks like we know what we’re doing. Very soon, Randy and Loni were driving in. “Hey I got my smoker lit up, do you want it?” “Don’t need it with suits, besides the bees don’t like smoke.” They zipped up their veils, walked confidently up to the hive, bees still circling angrily. Within a few minutes, they emptied the bait box of the remaining bees, got the bars into the log hive, installed the quilt box and pivoted the hat in place. They said the bees will settle down in a while and not too worry too much about working in the garden, they’d get used to you, but if they go through a dearth, they might get a little testy. We were much relieved. 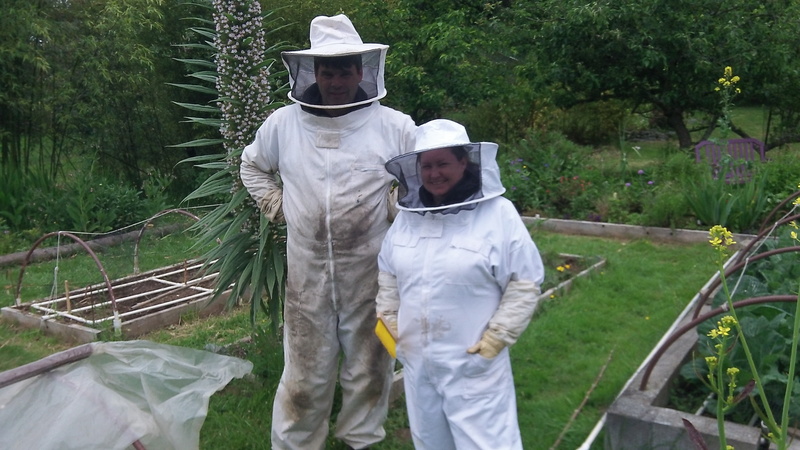 It was nice to see a husband and wife team working with bees. They have worked together for about 20 years so know exactly what to do to put things right. Their business name is Oregon Mountain Wild Honey. 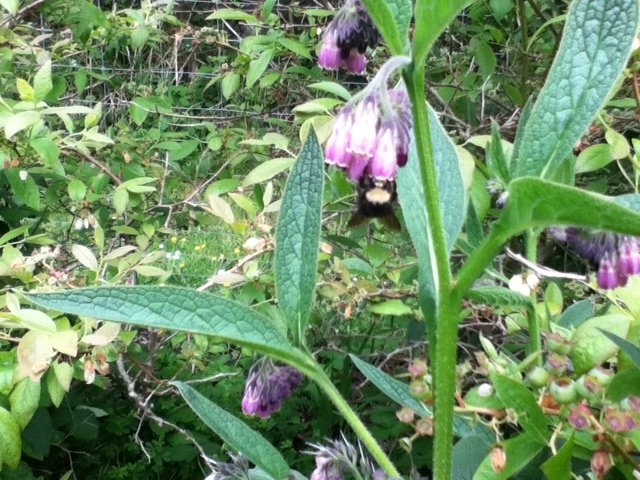 Bumble bee on the Comfrey, which can be considered invasive, but provides food for the bees. 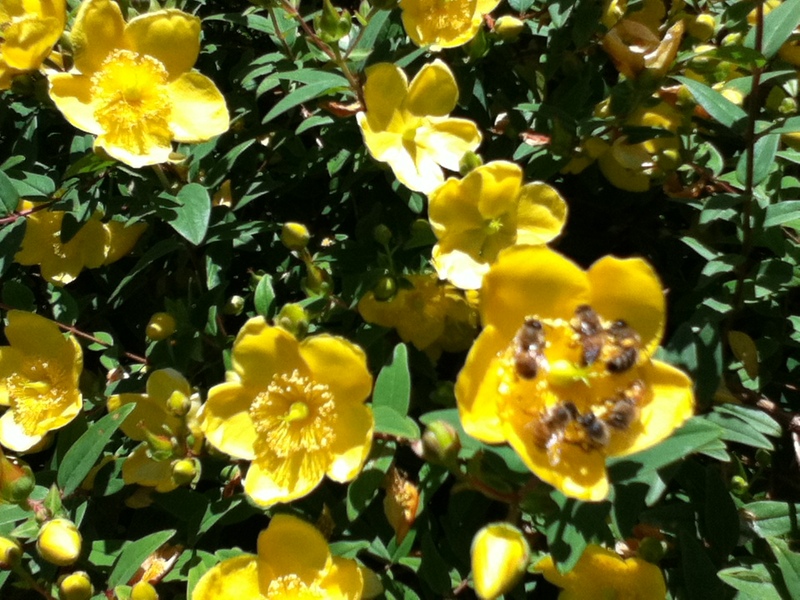 Bees go crazy on these blossoms (which I was under the impression were Island Bush Poppies) as can be seen in this fuzzy photo of six bees on a Hypericum. 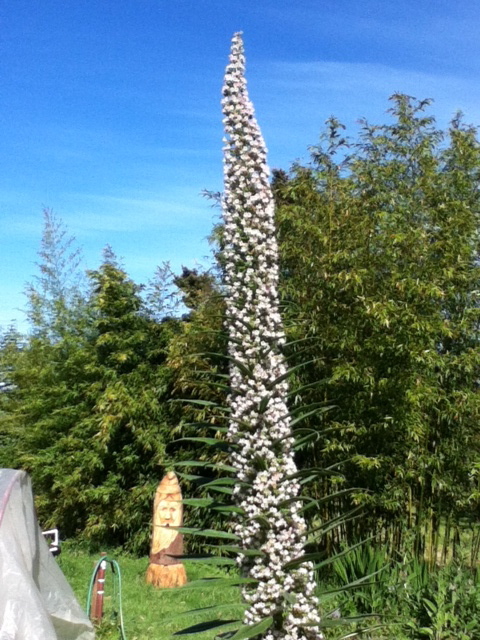 It’s covered with bees mid June to late July. 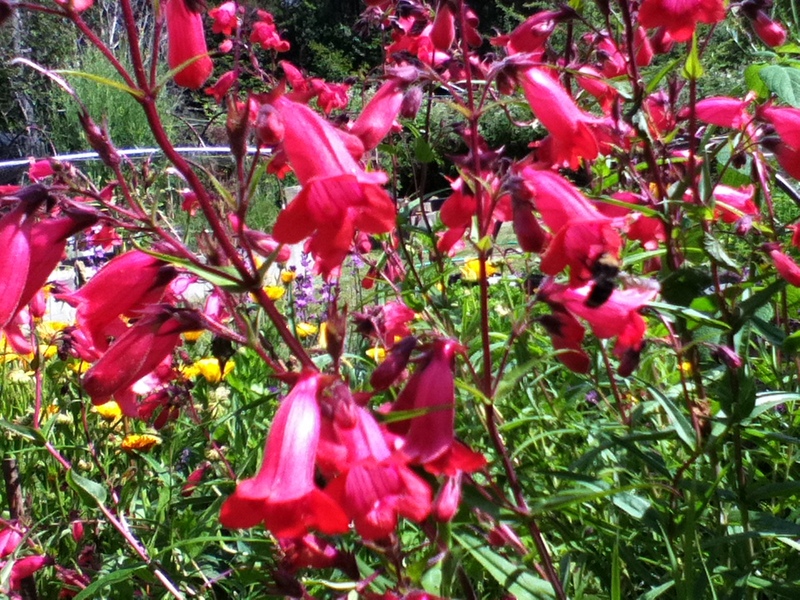 Bee diving into Penstemon blossom. These start blooming June. Dahlias, blackberries (main Oregon crop for bees), sunflowers, wall flowers, rosemary are also good bets for bees, as well as cotoneaster which grows wild and provides food late in the season. 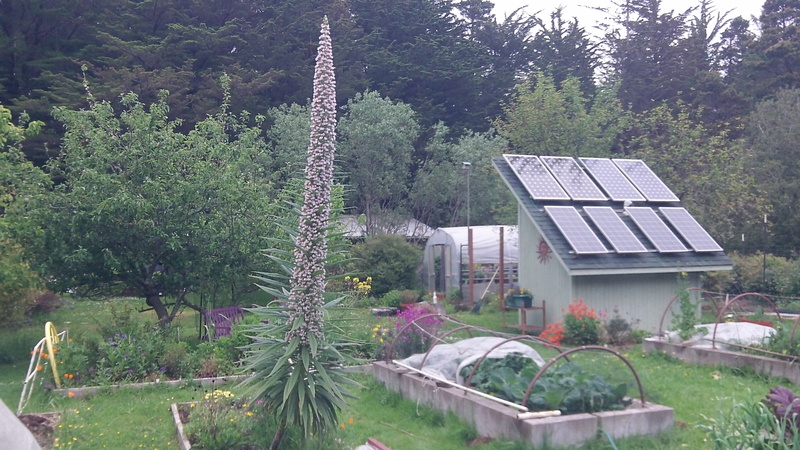 These are plants we’ve had in our garden. I’m sure there are many more. Please fill free to add to the list in the comments. 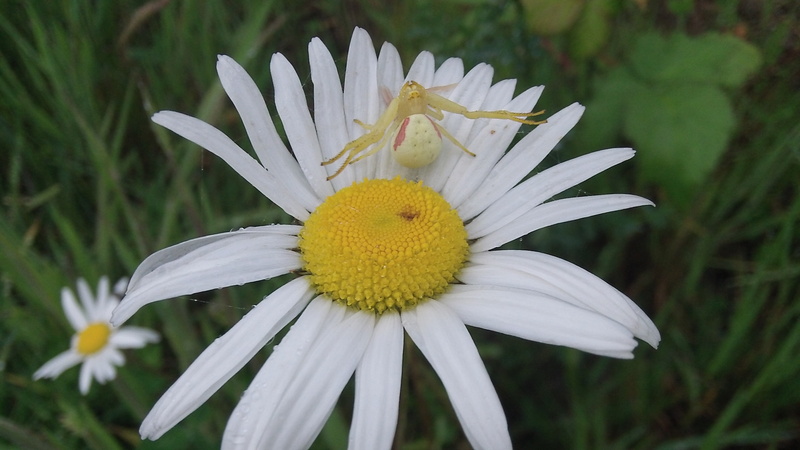 Many of these flowers serve as butterfly attractors also. See Butterflies.